← The BEST bootcamp routine in recent weeks! Who has ever used up the entire bunch of cilantro from the grocery store??! This feels like a once-in-a-lifetime experience but you too can join the “I used all my cilantro before it turned into a dark gloppy mess in the refrigerator” club! All you need is a little planning. The cilantro had been purchased for the steak tacos, and after daydreaming about that chimichurri for days afterwards, when I finally finished the steak (good thing steak taco salad is delicious because I ate it for DAYS after James was gone and couldn’t help me eat things anymore) I decided to test it out with another protein: salmon. I keep salmon on hand in the freezer because it is delicious, incredibly healthy, and cheaper that way. It’s also really easy to just take one out and thaw it during the day in the refrigerator when I know I want it at night. Plus buying fresh fish is a huge hassle when you have the world’s most inconsistent schedule. So really, the benefits are endless. I didn’t have another jalapeno, so this chimichurri consisted of whatever cilantro I had left, three green onions, three cloves of garlic, and a generous shake of cumin; with oil added later to make it pasty. I smeared it over the top of the salmon and baked it in the oven, saving half the fillet for later. With the remaining green onions (just 2) and a bit of a delicious smoky salsa that we had purchased for the tacos, I made a starchy side: black bean and corn salad. It was just a medley of beans (canned, rinsed), corn (frozen), chopped green onion, tomato, and celery; all mixed up and dressed with the salsa and a squeeze of lime. There was also a cauliflower in my refrigerator begging to be roasted, so in true Lauren fashion I tossed it with oil, salt, pepper, and garlic powder and ate almost 1/2 the head. 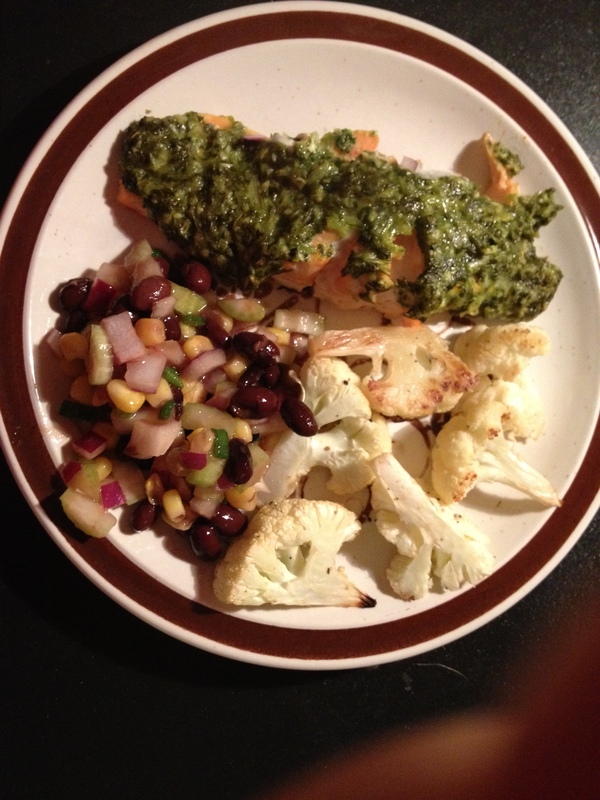 This entry was posted in Recipes and tagged black beans, chimichurri, cilantro, corn, dinner ideas, mexican, salmon, salmon recipes. Bookmark the permalink. 1 Response to Who has ever used up the entire bunch of cilantro from the grocery store?? !